Maybe it's that "chocolate gum theory" Russ is always talking about, but I'm a fan of both tomato soup and lentil soup, so logically, I was expecting to love this mash-up of the two classics. But Sonia and I both agree it's less than the sum of its parts. 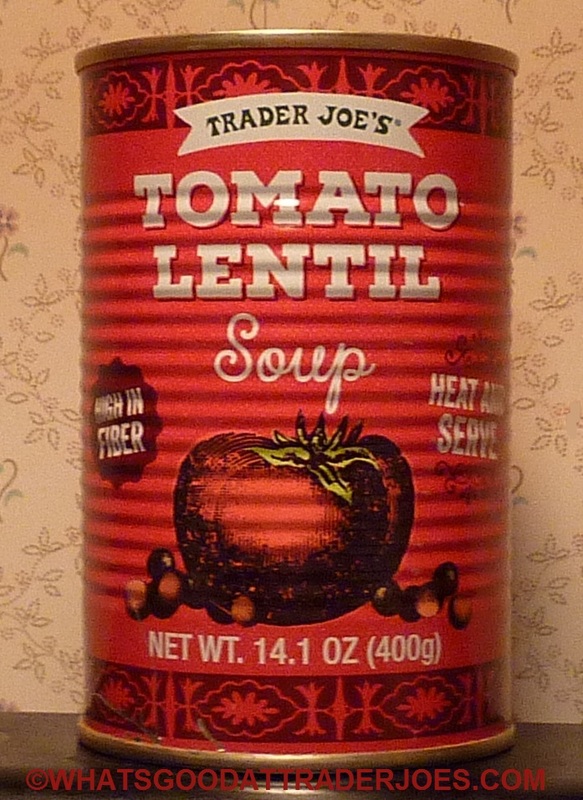 And it's a shame, because we were quite ready to fall in love with another unique soup from Trader Joe's. 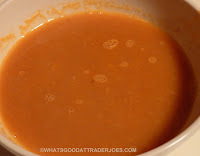 The broth was very thin—thinner than traditional tomato soup and certainly much thinner than my long lost TJ's Organic Tomato Bisque. 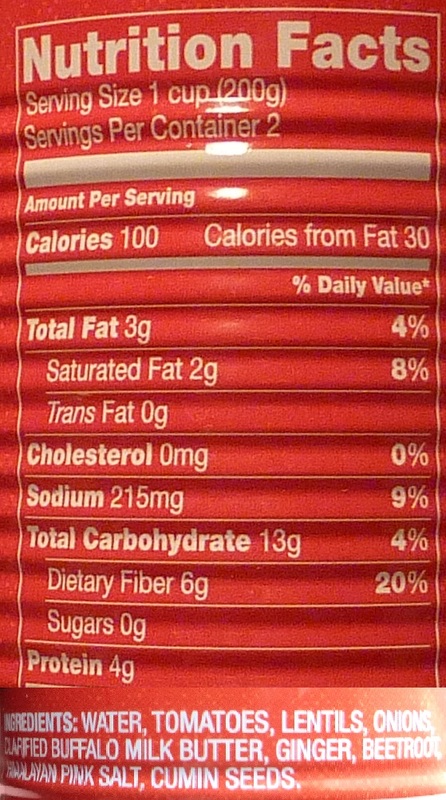 That fact, in and of itself, wouldn't have been enough to ruin the "tomato soup" element of the equation. But the fact that it wasn't super-tomatoey was. I mean, it was just kinda watery. There was a tomato essence, if you will, but it wasn't the flavor extravaganza it could have been. Even the lentils seemed to lack the richness of most traditional lentil soups. And there weren't enough of them. Any herb combinations present were too subtle to influence the taste in any meaningful way. 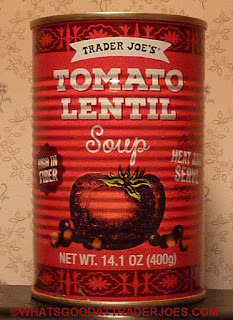 And rather than the lentil flavor and tomato flavor working together and reinforcing one another, it felt as though they were struggling to suppress each other. Although this will wind up sounding like an extremely negative review, I want to make it clear that I'm not saying this is a terrible product. It's not. It's a perfectly edible soup with a subtle earthy flavor, and it's certainly among the healthier products we've reviewed recently. 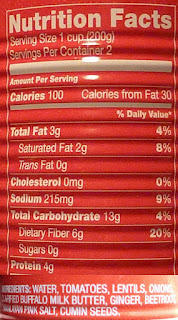 If a bowl of this stuff magically appeared in front of me right now, I'd eat it without complaint. The point I'm trying to make is that I'd always choose traditional tomato soup or plain old lentil soup over this mixture of the two. I just feel like it's a little too bland and blasé. But that's just me. Well, Sonia too. If anything, Sonia was even more down on this product than I was. In other news, one of the ingredients is "clarified buffalo milk butter." Yep. I don't even know how to elaborate on that. Just...yep. Two and a half stars from me. Two from Sonia. TJ's should be more creative. How about adding grilled cheese flavor to the soup. Called it grilled tomato & cheese soup. 2 childhood favorite in one! Cool site! My favorites are: pistachio white chocolate cookies, mango cream ice bars, vanilla soy ice cream, pink bag kettle popcorn, twisty garbanzo chips, cheapest price trader Joe's olive oil, calcium orange juice from concentrate, power berry balls, baked onion rings(sadly discontinued), wasabi oil (discontinued), minced not crushed bottled garlic (discontinued),soda water, Jameson, hoegaarden, soy sauce, ketchup, mayonnaise, samosas, veggie panang curry frozen meal, margherita pizza, hash browns, flat bread, hand pressed tortillas, cheapest between eggs, organic milk, marinated Hawaiian ribs, blue mountain coffee, chili dried mangoes, caramel wafers, and those chocolate covered berries you have on here .